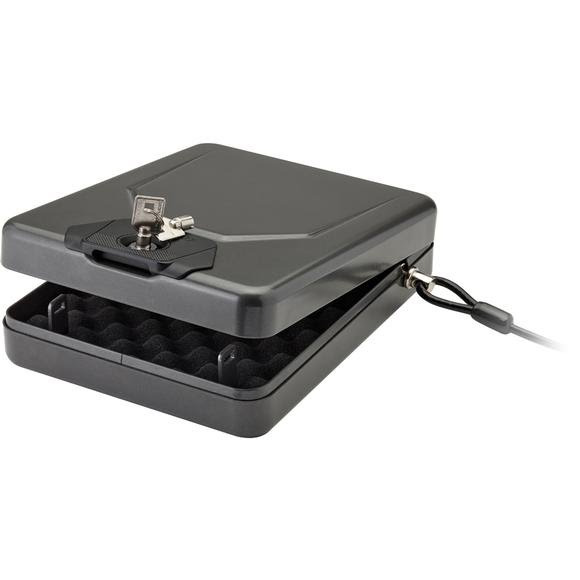 Hornady's Alpha Elite™ Lock Box lives up to its name with groundbreaking security technology to protect your handguns and other valuables. From its 16-gauge steel housing with pry-resistant security band and barrel key lock to its patent-pending dual crossbar latch mechanism, the Alpha Elite™ delivers top-notch security that standard lock boxes can't match. Hornady &apos;s Alpha Elite™ Lock Box lives up to its name with groundbreaking security technology to protect your handguns and other valuables. From its 16-gauge steel housing with pry-resistant security band and barrel key lock to its patent-pending dual crossbar latch mechanism, the Alpha Elite™ delivers top-notch security that standard lock boxes can&apos;t match. 3-foot steel security cable is rated for 1500 lbs.